Even with the Growth of Social Media, Email still Dominates when it comes to Coupon Delivery. 64% of shoppers prefer to get coupons via email while only 8% prefer social media channels such as FaceBook and Twitter. I have a hotmail account packed with thousands of email messages. 99% of them come from companies like Amazon.com, PartyCity.com, VictoriasSecret.com, Clinique.com, Gap.com, Target.com, and every other company that I’ve made purchases from in the past few years. This account of course is separate from my primary email account that I use for business and personal communications. Every few weeks or so, I login to my hotmail account, and scroll the subject lines, looking for any good deals that I should take advantage of. Sometimes, if I know I am going to shop at one of these stores, I login before I head out, to see if there are any printable coupons. 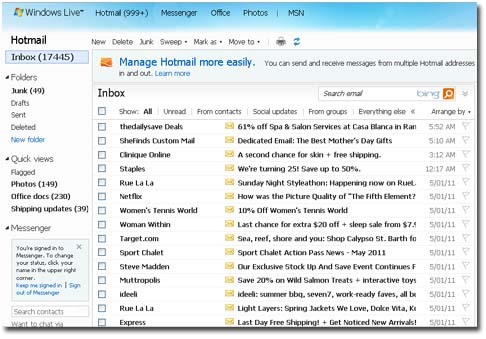 My hotmail account has become my virtual ‘coupon clipping’ storage space. And it turns out, I’m not alone. In fact according to a December 2010 eMarketers survey, 64% of shoppers prefer to get coupons via email while only 8% prefer social media channels such as FaceBook and Twitter. I’ve noticed that even FaceBook’s new coupons (available in only 5 cities as of April 2011) get delivered directly to my inbox, rather than waiting for me to login and see the coupon on my FaceBook newsfeed. However, just because social media channels may not be the number one place consumers look for coupons, they still plays a powerful role in the buying process. Consumers consider feedback from their trusted online circles about products from peer reviews. Consumers are actively reviewing how may FaceBook “likes” a product or company has …and Google just announced its +1 application, which allows even the pay-per-click search listings to show shoppers how many people in their social groups also support a company, before they even click on the ad. How consumers view your company on the social web is becoming a critical piece of the conversion process—especially when it comes to encouraging new customers to do business with you. While email continues to be a cost-effective tool in customer retention, social tools are dominating when it comes to reaching out to new audiences through your existing, loyal customers. So if you aren’t pushing coupons through social media, what are you doing with it? Since most social media users use sites like FaceBook and Twitter for the primary purposes of communication and entertainment, get in the mix. Offer entertaining, valuable and informative content that benefits your target audience by enhancing their lives, making it more enjoyable, easier or richer in some way. Holly Berkley is a San Diego based Online Marketing Consultant and author of Marketing in the New Media and Low Budget Online Marketing for Small Business. She has launched a 90 day corporate social media training program to teach businesses how to implement a social media marketing strategy that works best for their business goals and audiences. Learn more at www.corporate-social-media-training.com. This entry was tagged corporate social media training program, email coupons, facebook coupons, internet marketing, internet marketing books, low budget online marketing for small business, san diego marketing online, san diego online marketing consultant, social media, twitter coupons. Bookmark the permalink. That was very intriguing blog! !